In light of the recent Ebola virus disease outbreak, the nursing faculty at Memorial University of Newfoundland, School of Nursing recognized the need to reassess and reinforce undergraduate nursing students’ knowledge and skills related to infection prevention and control precautions and the use of personal protective equipment (PPE). Senior nursing students may have a very limited role in the identification of an Ebola case, depending on clinical placement settings, but teaching them about the expanded precautions used in the care of Ebola cases can serve to reinforce understanding of principles, stimulate interest in infection control, and enhance technical skills that are transferable to other patients with infections. A simulation-based clinical education experience designed for senior students in their final year of studies in the Bachelor of Nursing (Collaborative) Program was developed using a step-wise approach and following the deteriorating patient scenario (DPS) method. 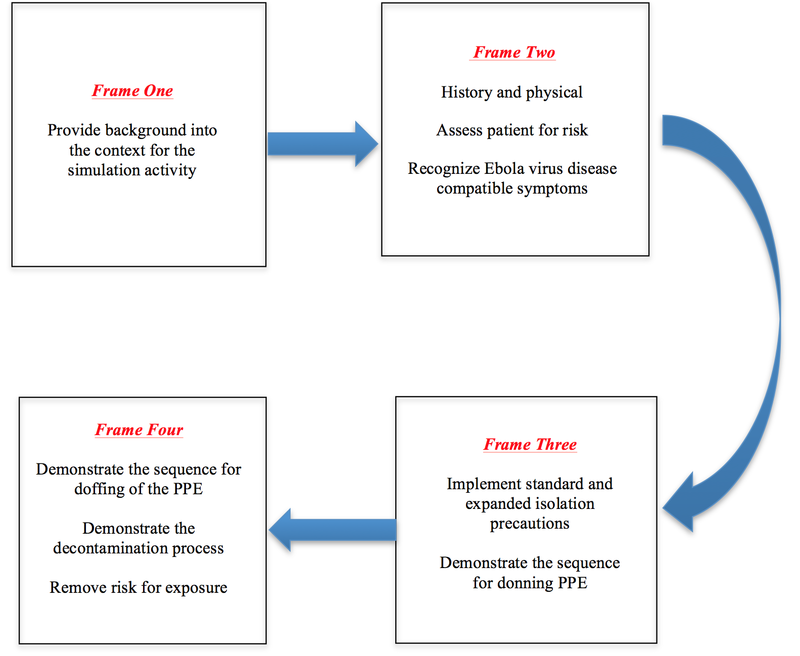 The simulation has four implementation frames that are linked to the four key learning objectives, which include the following: (1) recognize Ebola virus disease compatible symptoms, (2) implement the guidelines for expanded isolation precautions to prevent the transmission of the Ebola virus, (3) demonstrate the proper sequence for donning and doffing personal protective equipment (PPE), and (4) remove risk for exposure to the Ebola virus through decontamination. The simulation experience concludes with a video-based debriefing that followed a modified rapid cycle deliberate practice method. The current Ebola outbreak ravaging Guinea, Liberia, and Sierra Leone was first detected in March of 2014 and has since spread to other West African regions, with isolated cases in countries such as Spain and the United States. This is the worst outbreak of the Ebola virus in recorded history [1-2]. The Ebola virus is one of the Filoviridae families of viral hemorrhagic fevers . Since the original description of the Zaire Ebolavirus (ZEBOV) in 1976, five different viral subtypes of Ebola have been identified . The causative agent of the most recent outbreak, which occurred initially in Guinea, has been identified as an outlier strain of the ZEBOV and is the most virulent subtype of the Ebola virus . The most common cause of transmission of the Ebola virus is through exposure to the bodily fluids of an infected individual, to the mucosal tissues, or abrasions in the skin of an uninfected individual . The incubation period is between 2 and 21 days, with an average incubation period of 7-10 days, and as of yet, there is no vaccine; treatment is supportive . A major concern with the diagnosis of Ebola is that the early clinical symptomatology appears non-specific at first, consisting of fever and myalgia, and followed by flu-like and gastrointestinal symptoms . These symptoms further develop as endothelial damage occurs in multiple tissues and organs with hemorrhage, disseminated intravascular coagulation (DIC), shock, and multi-organ failure seen in cases that progress; the mortality rate in the current outbreak is 50% [7-8]. The amount of virus contained in blood and body fluids increases as symptoms worsen, increasing the risk of transmission . The risk to healthcare workers caring for these patients is significant; thus, strict adherence to infection control guidelines is paramount. The Public Health Agency of Canada (PHAC) and the Centers for Disease Control and Prevention (CDC) have developed infection control guidelines to ensure that healthcare workers are prepared to meet the global health challenge of caring for a patient with Ebola virus disease and containing the transmission of the Ebola virus [10-11]. The appropriate level of personal protective equipment (PPE), comprehensive education on how to put on (i.e., don) and take off (i.e., doff) the PPE, following the proper decontamination protocols, and a commitment to stringent safety precautions can all help to eliminate the risk of transmitting the Ebola virus from an infected patient [10-11]. Insufficient or inadequate supplies of appropriate PPE and a lack of education on infection control guidelines for healthcare workers are factors that have contributed to the increased risk of transmission of the Ebola virus to healthcare workers during this outbreak . While breaches in practice during the provision of care can lead to exposure, the greatest risk of exposure for healthcare workers occurs during the removal or doffing of the contaminated PPE if adherence to the stringent procedure is not met. Since nurses represent key frontline healthcare workers who will care for patients experiencing Ebola, they need to be able to recognize Ebola virus disease-compatible symptoms, and implement the relevant protocols, including properly donning and doffing of PPE, and reducing the risk of transmission of the virus through appropriate decontamination. We anticipate that nursing students will not care for a patient with Ebola virus disease in the current outbreak. Senior nursing students may have a very limited role in the identification of a patient with Ebola virus disease, however. Depending on their clinical placement settings, they may have already witnessed activity on some clinical units related to preparation for the care of suspect Ebola cases. Teaching them about the expanded precautions used in the care of Ebola cases can serve to reinforce the understanding of principles, stimulate interest in infection control and enhance technical skills that can be transferred to other patients with known and suspected infections. In addition, they will be better prepared as new graduates to contribute to a supportive practice environment in the care of patients with infections. We, therefore, see the value of involving senior nursing students in an Ebola-related simulation training exercise. Using pedagogically sound simulation-based clinical education strategies, we describe an experience designed to teach senior nursing students how to appropriately manage a patient presenting with Ebola virus disease; the exercise can also be readily adopted for use with nurses as well. This technical report describes a simulation-based clinical education experience designed for senior undergraduate nursing students. The learning objectives of the experience include the following: (1) recognize Ebola virus disease compatible symptoms (2) implement the guidelines for expanded isolation precautions to prevent the transmission of the Ebola virus, (3) demonstrate the sequence for donning and doffing personal protective equipment (PPE), and (4) remove the risk for exposure to the Ebola virus through decontamination. This simulation activity is based on guidelines from the CDC for PPE use by healthcare workers during the management of patients with Ebola virus disease. These guidelines are the most readily available, although different local protocols may vary slightly by jurisdiction. For example, most areas in Canada will use disinfectant wipes for decontamination of gloves rather than alcohol-based hand rub; the CDC guidelines identify that either can be used. The symptoms identified in the scenario are consistent with the symptoms identified by the Public Health Agency of Canada national case definitions [10-11]. The simulation-based educational experience takes place in a laboratory setting that mimics the emergency triage area in a hospital emergency department. That area consists of an isolation room with a connecting antechamber where students can don and doff the required PPE. This simulation activity uses a standardized “live” patient as the focus of care and a standardized trained observer. The CDC protocol mandates that a trained observer supervises the donning and doffing procedure, assisting as needed, using a checklist to ensure all steps are completed in the correct sequence. Prior to the simulation exercise, a case scenario consisting of four implementation frames was designed (Figure 1). The frame design followed a stepwise, simulation-based clinical education experience developed to follow the deteriorating patient scenario (DPS) method [13-15]. In line with the DPS method, each simulation frame has a set of expected actions, and if the actions are correct, the scenario progresses to the next frame or sub-frame. In the event that the student has difficulty with demonstrating the expected actions, the instructor will offer students progressively more revealing and informative “hints” as to the proper course of action. Once students recognize and display the proper actions, the scenario progresses to the next frame. “You are an emergency room registered nurse working in the local hospital. You have been assigned the role of triaging patients. Your role is to triage patients according the type and severity of their presenting signs and symptoms. This includes ensuring that the sickest patients are seen first by the emergency room physician. There is an emergency room physician, a Charge Nurse, and four other emergency room nurses on shift. There is also an Infection Control Team in place for patients presenting with the Ebola virus disease. The patient is a 34-year-old biology graduate student from the province of Newfoundland. She recently traveled to Sierra Leone to complete a research project on the effectiveness of bat bioacoustics monitoring. Her only past medical history is a congenital heart defect, which is asymptomatic. Central Nervous System Complaining of severe headache; alert and oriented. Gastrointestinal Complaining of nausea and vomiting, anorexia, bloody diarrhea, and abdominal pain for the last two days. She is progressively getting worse and only taking sips of water. -Severe headache, erythematous maculopapular rash on the trunk, nausea, vomiting, pharyngitis, bloody diarrhea, myalgia, malaise, abdominal pain, and/or unexplained hemorrhage. -Direct unprotected contact with bats in an Ebola-affected country. Recognize the patient as a potential Ebola case and explain actions to the patient. Notify the charge nurse or the physician that this is a potential Ebola case. Verbalize the need to implement expanded isolation precautions for Ebola and to alert the Infection Control Team. Ask student to articulate key concerns for this patient. Ask the student what system is the focus of attention: Gastrointestinal (GI). Prompt student to reflect on common causes of GI disturbances. Ask what would be the concern if temperature > 38.6 C, and patient recently traveled to a high-risk country. Ask student to think about recent travel advisories in the media. Ask the student to articulate the difference between standard and expanded isolated precautions. Initiate guidelines for standard and expanded isolation precautions for the transmission of Ebola as per CDC and PHAC guidelines. Refer to institution’s infection prevention control guidelines and policies for the care of a patient with Ebola virus disease. Put a mask on the patient and brings her to the designated room with anteroom and dedicated washroom facilities. Keep the door to the patient’s room closed. Place contact and droplet isolation sign on the door. Explain to the patient the rationale for expanded isolation precautions. Using the checklist provided, review the PPE stocked in the anteroom and identified if/what additional PPE needs to be obtained. Identify the anticipated dedicated medical equipment needed to care for the patient (e.g., hands-free garbage, impervious waste-holding bags, no-touch receptacle linen container, bedpan, thermometer, sphygmomanometer, emesis basin, stethoscope etc.). Prepare logbook for those entering and exiting isolation room. What types of precautions are needed in this case? What type of room is needed to implement the isolation precautions required in this case? What members of the team would be important to coordinate the care of this woman? What PPE equipment do you need to care for an Ebola patient? Ask are there any special considerations you need to consider when preparing the isolation room? Consider the removal of infectious material from the isolation room, what equipment would you need? Select the proper PPE that is recommended by the CDC guidelines, assisted by the trained observer and the checklist provided. The PPE selected should be the appropriate size and material. -Two sets of examination gloves with extended cuffs. -Waterproof boots or washable shoes. -Waterproof boot covers that go to at least mid-calf, or leg covers. -A gown that extends to at least mid-calf or coveralls. -N95 respirator, full-face shield, and a hood that extends to shoulders. -An apron that covers the torso to the level of the mid-calf (and that covers the top of the boots or boot covers). Clarify with the trained observer the procedure for following the checklist and obtaining assistance with donning PPE. -Remove personal clothing and items and change into scrubs. -Remove any personal items (e.g. jewelry) and ensures the hair is away from the face. -Inspect PPE prior to donning for defects. -Put on gown or coveralls, with assistance for tying if necessary. -Make sure cuffs of inner gloves are tucked under the gown sleeves. -Put on an N95 respirator; complete a user seal check. -Put on an outer apron. -Put on outer gloves; ensure outer glove cuffs are over gown sleeves. -Put on face shield over the surgical hood and N95 respirator. -Verify with trained observer and ensure no skin is exposed. -Disinfect outer gloves with an alcohol-based hand rub (ABHR) or disinfectant wipe and dry before entering room . Ensure entry into the patient’s room is documented in the logbook. Prompt student to articulate the rationale for PPE with the Ebola virus. Inform the student that a trained monitor is available to help. Ask the student what documentation is important prior to entering the room. Ask the student to reflect on any potential breaks in the procedure that could lead to exposure to the virus. Remove PPE without self-contamination or contamination of the environment. Provide the rationale as to the sequence of PPE removal. Clarify with the trained observer the procedure for following the checklist and obtaining assistance with doffing PPE. -Inspect PPE for any tears, contamination, or cuts. -If contamination is visible on any PPE, disinfect with ABHR or disinfectant wipes. -Disinfect outer gloves with ABHR or disinfectant wipes. -Remove apron; roll from inside to outside. -Inspect PPE again as above. -Remove shoe covers while sitting down and discard. -Disinfect and remove outer gloves. -Inspect and disinfect inner gloves. -Remove inner gloves, perform hand hygiene, and don a clean pair of gloves. -Remove surgical hood and discard. Pull away from the body, rolling from inside to out and touching only the inside of the gown. Turn contaminated outside toward the inside. Only the clean part of the gown should be visible. -Disinfect and change inner gloves. Don a clean pair of gloves. -Disinfect inner gloves and remove. Respond appropriately to breaks in the protocol or potential breaches (e.g., additional decontamination, changing gloves), identifying the potential sources of contamination and provides rationales. PPE is disposed of properly and placed in a leak proof infectious waste container. Prompt the student to ask the monitor to assist with the removal of PPE. Guide the student through the process of taking off the equipment: What is the first piece of PPE to be removed and why? Ask the student what is the final step once all PPE is removed (final inspection). Prompt the student as to how they would document time spent in the isolation room. Ask the student to reflect on any potential breaks in the protocol. Feedback and debriefing were accomplished in two ways. First, during the simulation and because the skills involved are very procedural, we have selected to follow the modified rapid cycle deliberate practice method as outlined by Hunt, et al. . When errors or unwanted actions were spotted, the educator would stop the student and provide them with feedback in the form of progressively more informative hints. The student would be then asked to repeat the frame that contained the error or unwanted action while incorporating the hints and feedback. In additions, the entire encounter with the Ebola-simulated patient is video recorded and used for debriefing. The student and the educator review the video recording together, and the educator pauses the video at any time that a breach occurred or potentially could have occurred or where there was difficulty with any aspect. The educator would follow the “frame discovery” approach  and ask the student to describe the reason for taking a particular action or to explain the source of the breach or difficulty. Subsequently, the educator and student would discuss appropriate actions and rationales. In addition, to assess understanding of enhanced precautions for Ebola virus disease compared to contact/droplet precautions for influenza, the student would be asked to identify what would have happened if the patient had influenza and not Ebola virus disease. This technical report described a simulated clinical education experience designed for senior undergraduate nursing students. The learning objectives of the simulated teaching experience included: (1) recognition of the clinical presentation of an individual with Ebola virus disease, (2) implementation of the guidelines for isolation precautions to prevent the transmission of the Ebola virus, (3) demonstration of the sequence for donning and doffing personal protective equipment (PPE), and (4) removal of risk from exposure to the Ebola virus. The simulation was designed based on the DPS method, and a set of required actions and hints were prepared in order to guide the students through the scenario. In addition, a modified, video-based rapid cycle deliberate practice method for post-simulation debriefing is used, as it is best suited for this type of skill and this level of students. Although we acknowledge that the protocols for dealing with Ebola virus disease infected patients are changing rapidly, we have adapted the best available protocols at the time of preparation of this technical report. However, the general method of presenting the simulated patient is modular and accommodating to follow any future updates to the protocols. Public Health Care Agency of Canada: Interim Guidance-Ebola Virus Disease: Infection Prevention and Control Measures of Borders, Healthcare Settings and Self-Monitoring at Home. Canada Communicable Disease Report. 2014, 40:15. Accessed: October 24, 2014: www.phac-aspc.gc.ca/id-mi/vhf-fvh/ebola-ipc-pci-eng.php. CDC Tightened Guidance for U.S. Healthcare Workers on Personal Protective Equipment for Ebola. (2014). Accessed: October 24, 2014: http://www.cdc.gov/media/releases/2014/fs1020-ebola-personal-protective-equipment.html. Siegel JD, Rhinehart E, Jackson M, Chiarello L, the Healthcare Infection Control Practices Advisory Committee: Guideline for Isolation Precautions: Preventing Transmission of Infectious Agents in Healthcare Settings. Centers for Disease Control and Prevention. 2007, Accessed: October 24, 2014: http://www.cdc.gov/hicpac/2007IP/2007ip_part4.html. Guidance on Personal Protective Equipment To Be Used by Healthcare Workers During Management of Patients with Ebola Virus Disease in U.S. Hospitals, Including Procedures for Putting On (Donning) and Removing (Doffing). (2014). Accessed: October 24, 2014: http://www.cdc.gov/vhf/ebola/healthcare-us/ppe/guidance.html. Manuel et al. This is an open access article distributed under the terms of the Creative Commons Attribution License CC-BY 3.0., which permits unrestricted use, distribution, and reproduction in any medium, provided the original author and source are credited.